The words Biuro Podrozy translate as travel agency. It’s a phrase you see on shop fronts all over Poland, perhaps not least in these days of mass emigration. For the keen Fringe-goer that comes as a surprise. 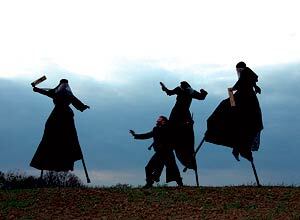 Nobody who saw Carmen Funebre (Funeral Song) by Teatr Biuro Podrozy in the playground of Drummond Community High School for a few fleeting days in 1995 will forget its atmospheric evocation of the war in Bosnia, fire blazing while masked figures on stilts got frighteningly close. It was the surprise hit of that year’s Fringe and has since been seen in 27 countries, plus a return run at the Old College Quad in Edinburgh the following year. Travel Agency Theatre is, therefore, a fitting name for a company so tirelessly on the move, but if you didn’t know better you could believe they had offices all over Poland. Rather than that, the name harks back to the company’s early years in a post-communist country when suddenly no one was interested in theatre any more. Capitalism had arrived and there was too much shopping to be done. Instead of admitting defeat, director Pawel Szkotak resolved that if the people wouldn’t come to the theatre, he would take the theatre to the people. Thus we find ourselves on a pleasant Warsaw evening in a public park awaiting a performance of Macbeth: Who Is That Bloodied Man. The actors have marked out their territory in an open square, placing seven raw-looking tree trunks in a circle in front of a platform hidden behind a metal grating. The audience is gathering casually on a set of steps to ensure a good view. Even at this early point in the evening, with the performers revving their motorbikes in preparation, you sense something unusual about Teatr Biuro Podrozy: where other outdoor theatre companies are fun and fantastical (usually the French) or fun and ferocious (the Catalans), this lot have no qualms about taking heavyweight drama onto the streets. With stilt-walking, burning torches and an operatic singer overseeing the action, they certainly have a sense of the spectacular, but they don’t equate playing to a popular audience with serving up trivia. Theirs is a theatre that is both accessible and serious. Like Carmen Funebre before it, this Macbeth is a response to the horrors of a world at war. Where previously it was the former Yugoslavia, now it is Iraq, although audiences around the world tend to find parallels of their own. Szkotak uses Shakespeare’s play to demonstrate the bloody consequences of unbridled ambition. He doesn’t make exact parallels (Macbeth is neither George Bush nor Saddam Hussein), but there is imagery enough – from an Abu Ghraib-style naked prisoner in a cage to stiltwalking witches in white burqas – to make us sense the contemporary relevance. With each death another tree trunk falls, giving a palpable sense of the unstoppable juggernaut of war. ‘The Iraq war started to be very important to people,’ says Szkotak, explaining his choice of Shakespeare’s play. ‘But there is also the war in Afghanistan and World War II still exists in our memory. So I couldn’t say this is a play about the Iraq war as much as it is a performance about people who have blood on their hands, like Macbeth – and like other soldiers.’ He is naming no names, but then he doesn’t have to. Macbeth: Who Is that Bloodied Man, Old College Quad, 662 8740, 5–27 Aug (not 16, 17), 10pm, £11 (£8). Macbeth: Who Is That Bloodied Man? 'Teatr Biuro Podrozy' is Poland's foremost outdoor theatre company, here presenting a daring interpretation of the Macbeth story that includes fire, stilts, motorbikes and plenty of music. The production has attracted breathless reviews from critics around the country, and now comes to Inverness as part of a summer tour.